Like almost everything else in life these days, getting on a bicycle used to be easier. Much easier. Nevertheless, last Monday I put my left foot on the left pedal and then somehow raised my right leg over the rupture bar, swung it over the high seat and without making a scene landed my right foot on the right pedal. All I kept thinking was “don’t hurt yourself, don’t pull a groin muscle”; but then I thought at my age, a pulled groin muscle is almost a badger of honor. If nothing else it proves I still have one. And it sure beats a cinco de bypass. A wonderful day of memories and smiles with Andi in Hyde Park last week. Somebody, I think it was Donald J. Trump, once said that when you first learn to ride a bike you never forget how. I wasn’t so sure of that as, fully mounted, my first pedal turn in decades resulted in my latching onto a neighboring iron pole to stop what seemed like an inevitable fall. On the second pedal turn I swung the other way which fortunately had the bike rack cemented to the pavement for me to grab for balance. 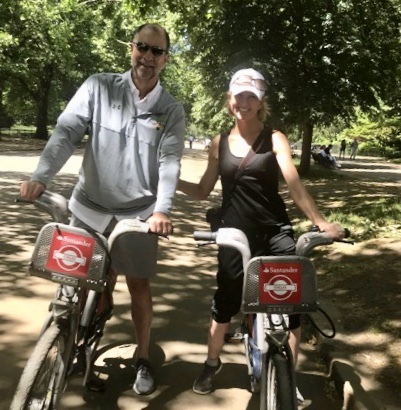 Andi wanted to go bike riding in London’s pretty Hyde Park last week and in a senior moment, I agreed to go with her. Truth is, it turned out to be a very pleasant hour. A happy hour. Once I got going and figured which brake, the front or back, wouldn’t throw me off the two-quid-per-hour rented cycle, the rest became a muscle memory recall of how to do it. It came back to me just like the President said it would. London is one of my happy places of life. Being on that bicycle, and not falling off, was a happy moment. I smiled remembering my dad teaching me to ride, sans training wheels, back in the late 1950s and then me doing the same for my kids in the 80s. The first time you let go of the back of the seat and see the wheels go around on their own is a moment of fear and joy that will never leave. Today is my first Father’s Day without my dad. I can smile. We peddled along the park’s Serpentine Lake and I smiled thinking about the sixty-five dad’s days I was blessed to spend with Herb Berger. Of the memories of our first baseball game together at Yankee Stadium in 1959. Of celebrating our Pirates winning the World Series a year later with a big hug and of him coaching my Little League team, which was the only way I got to play. Then going back to Yankee Stadium two years later in 1961 to see a high school classmate of Dad, Rudy Hernandez, a relief pitcher for the Washington Senators. A few days before the game, Mr. Hernandez promised Dad that after the game he would bring me down to the Senators locker room to meet all the players. I was giddy. We got to the Stadium on that May afternoon and paid fifteen cents for a scorecard. Rudy Hernandez was not listed on the roster. We fast-walked down to the bullpen, which in those days were located down the left and right field lines and very accessible. Dad asked someone in a Washington uniform “Where’s Rudy Hernandez?” The answer was a shot in the gut: “He got sent to the minors yesterday.” I wasn’t smiling. A couple of weeks later Dad got a postcard from Rudy, which I still have, wanting him to apologize to me and telling Dad that “when I get back up to the majors I will make it up to your boy.” Rudy Hernandez never pitched in the major leagues again. That’s okay, I now can smile at the memory from fifty-seven years ago which is still as vivid as this morning’s breakfast which I do remember I haven’t eaten yet. Breezing on the bike past the Lady Di Fountain, I remembered Dad four years later in 1965 standing proudly, beaming on the bima, at my bar mitzvah; of my high school graduation in ’70, and the college degree I earned four years later with his money. Of him being proud of me getting my first job; getting married; having two sons; a career with steady paychecks and when he first met Andi and then me getting married all over again. Riding through Speaker’s Corner, I can smile remembering the years Mom and Dad sent me and my brothers to summer camp thinking they were doing it for us and realizing later, much later, it was actually their vacation. I remember how my parents loved to travel, on any cruise to anywhere, and how Dad loved going to Las Vegas. A casino comp, any comp— the coffee shop, hotel room, dinner or a show was a very big deal. It was a comp after all, and that meant bragging rights to his cronies when he got home. I can’t help but believe a small part of our move to the desert in a few months was influenced by Big Herb and his love of Vegas. And how he taught me how to use one of the great comedic props of his generation, a fartsograph, for the first time. Stopping at the park’s Holocaust Memorial I remembered how compassionate my dad was during Mom’s illness and her final years. Then he found Diane Gelberg and the joy she brought to him. He was smitten like a high schooler wearing a varsity letter in a malt shop. She gave him at least three additional years he wouldn’t have had otherwise. I have no doubt about it. That makes me smile. 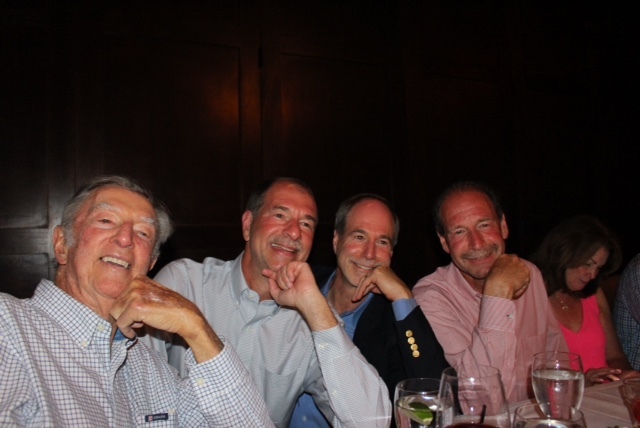 This one is my favorite- Dad, me, Mike and Ken, with the wrong chin hand, in 2015. Nearing the French Embassy, I smiled at the joy he had when he schemed to save a few pennies or to beat the system, any system, and how it delighted him. And how he looked forward to his Monday night poker games and Tuesday morning breakfasts with the condo boys. Then at a restaurant, no matter how hungry he was, he would take half the portion home for the next day. How he loved planning his meals for three/four days in advance. How every morning he would repeat over the phone his daily schedule, down to the most trivial detail, to me, Mike and Ken. It was like he was reading from a script. Maybe he was. Or it could be ninety degrees outside and Dad was cold. Always cold. Always wearing that tattered New York Islanders windbreaker. Indoors, too. I smile every time he complained about almost everything, which was almost all the time. I would ask him “Dad, is anything okay?” He didn’t smile. He laughed. Dad lived eighty-eight great years. 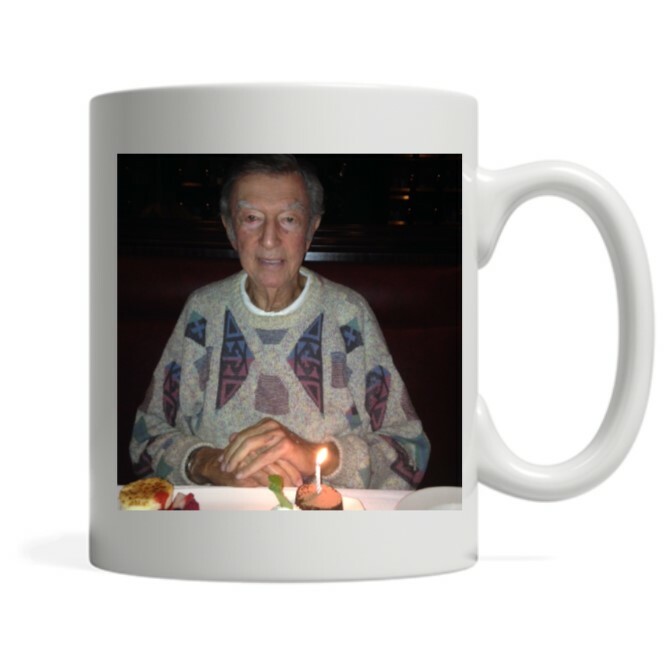 His eighty-ninth wasn’t so good as congestive heart failure combined with kidney disease that ultimately took its toll last February 28 on a gentle, happy, fun man. I didn’t smile then. 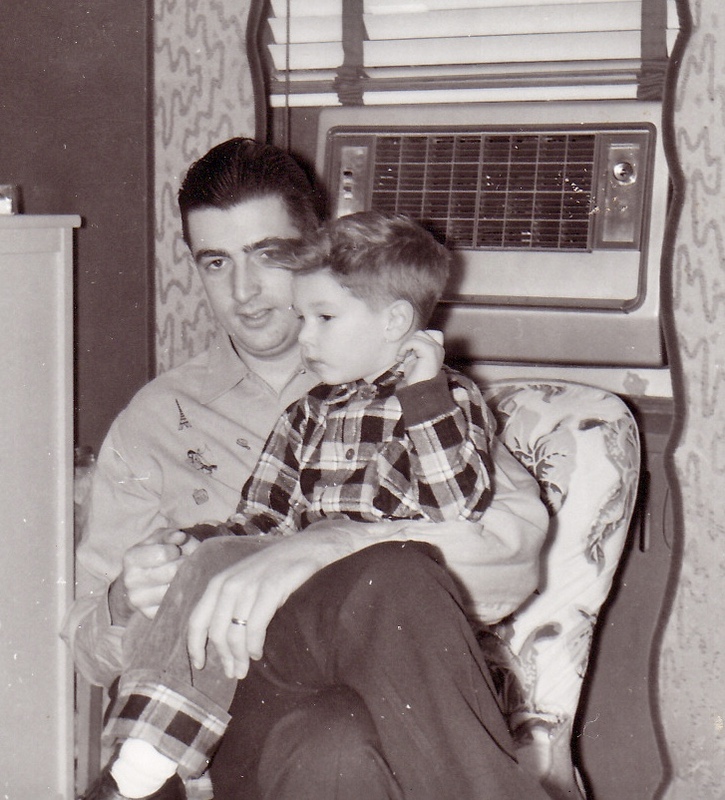 And because of some good fortune, not necessarily foresight, I saved about a dozen voice mails from Dad. Now every morning at eight, precisely when he would have phoned me, I play a message from him. It’s the way I want to start my day. I know all of them line by line. I smile after each message. I miss him in my life, tremendously, but I smile when I think about Dad. I hope one day, after I’m gone, my sons take a bike ride through Hyde Park. I am so happy that you have these wonderful memories. Great for Father’s Day, Roy. Terrific. Loved Tuesday night. Great seeing you. Looking forward to the next get together. Greetings from Southern California!! Have my own business & happy! Thank you for always pushing me & making my skin tough! You taught me alot.